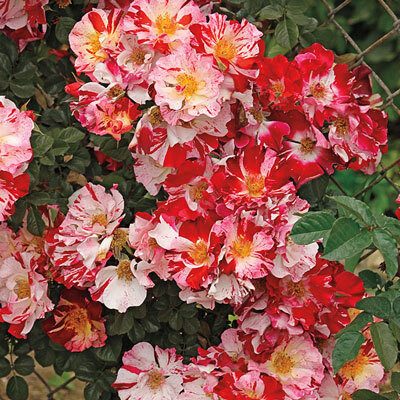 Fourth Of July Climbing Rose | Henry Field's Seed & Nursery Co.
A profusion of season-long blooms. An explosion of eye-popping color for the landscape is just the beginning of the festivities ahead from this fragrant Climber. You'll get a bang out of the big sprays of large long-lasting blossoms. And the fireworks just seem to keep coming because it blooms and reblooms readily in the very first season. 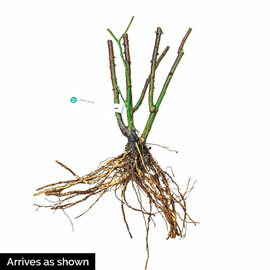 Sparkling green foliage, superb vigor and good hardiness complete the spectacle. U.S. Patent No. 11518. Flower Form: Large, semi-double in clusters, 10-15 petals count, light, crushed apple fragrance.